News / Spring 2018 Newsletter / Greetings from David Steele! We have had a productive winter at the site and when visiting this spring you will begin noticing the early signs of construction of the new $2.2 million Singing Winds Visitor Center. The center is scheduled to be completed in fall 2018. This impressive center will be 4,600 square feet and will allow for the consolidation of the admission office, museum shop, and staff offices into one location. It will feature an orientation area, coffee bar, workroom and an expanded gift shop. The project is being funded through a gift from Barbara and Bob Stevens, as well as a matching gift from the state. Additionally, the Friends of T.C. 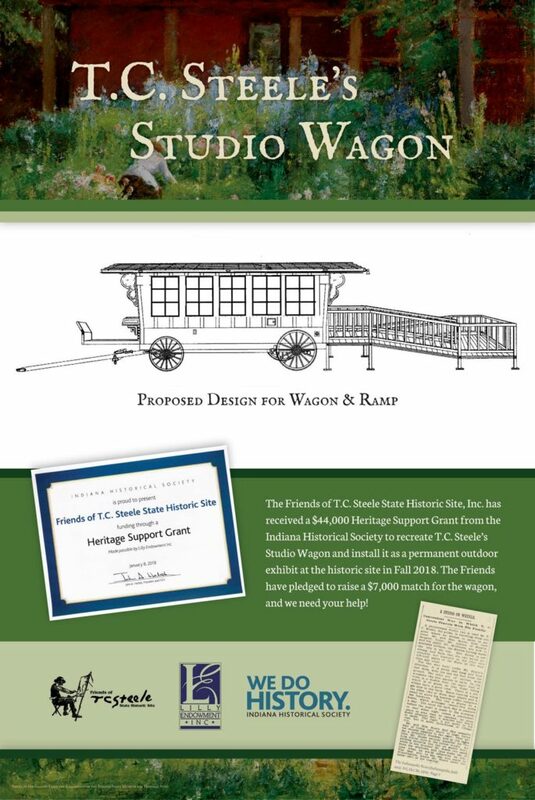 Steele State Historic Site has been extremely fortunate to be awarded a Heritage Support Grant from the Indiana Historical Society to build a replica of T.C. Steele’s Studio Wagon. Steele used this wagon to travel with his family, painting Indiana landscape in an Impressionist style during the period of 1896-1913 (see The Indianapolis News article below for details). The original wagon was destroyed in a barn fire on the historic site in 1913.
member feedback for improvement. We have completed our Strategic Plan for 2018-2019 and it will be placed on our refreshed website soon. We also want to welcome our newest board member, P. Garrett Adams of Indianapolis. Garrett is an Associate Consultant and Pharmaceutical Project Manager at Lilly Research Laboratories, Eli Lilly & Company- so holds an MBA in Finance from Butler University. In closing, we want to thank you for your support of the historical site. We look forward to seeing you often this year as the site begins a significant transformation. Friends of T.C. Steele State Historic Site, Inc.